The peaks of Huashan Mountain from above are said to resemble the petals of a huge plant, with the middle peak as the corolla, hence comes the mountain's name, Hua Shan, the "flower mountain". Of the five peaks it is the southern peak (2,100 meters) that is the largest, closely followed by those in the east and west. The ascent provides not only natural scenery, but also a number of man-made constructions that, for better or worse, are now a part of the mountain's tourist culture. The route to conquer the peaks passes by temples, shrines, pavilions, terraces, carvings, statues, food stalls and hawkers, that appear interspersed between the stark granite paths and forested margins. The five peaks of Huashan Mountain have vivid names. The south one is called the Peak of the Wild Geese (Luo Yan Feng), the east one, the Peak of the Rising Sun (Zhao Yang Feng), the west one, the peak of Lotus (Lian Hua Feng), the Central one, the Peak of the Jade Maiden (Yu Nu Feng) and the north one, the Peak of the Cloud Terrace (Yun Tai Feng). The latter two are not so tall as the former three, yet each presents a kind of scenic beauty of its own. The three main peaks, acclaimed as "the three magnificent peaks under heaven" (Tian Wai San Feng), stand like the three legs of a tripod in the blue sky. 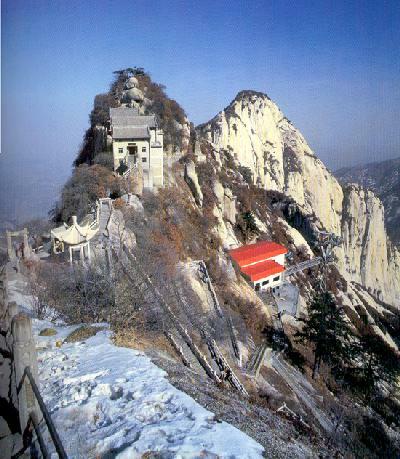 The south peak is the main peak and also the steepest of Huashan. 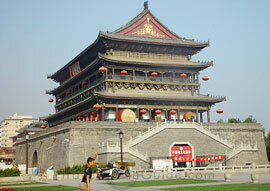 Legend has it that Laozi, the originator of Taoism, used to missionize here. 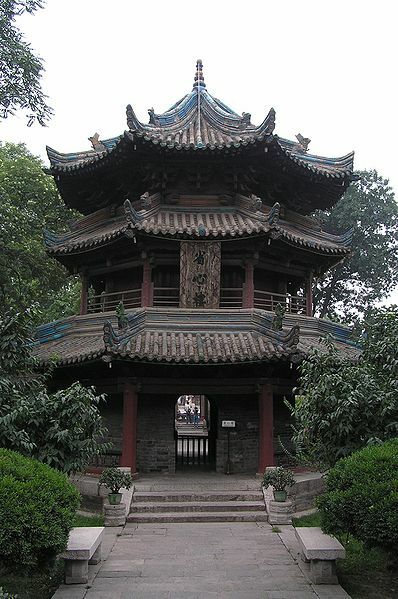 Among the many temples, the Jintian Palace, the Zhenyue Palace and the Chunyang Temple are the listed among the state-level Taoist structures. 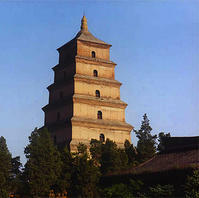 The Green Cloud Temple is also called the Holy Mother Temple. It enshrines statues of three holy mothers. There is a large stone cut into three parts outside. It is the well-known "Axe Cutting Stone" for it looks as if it is being cut by an axe. Beside the stone, there is a huge axe. 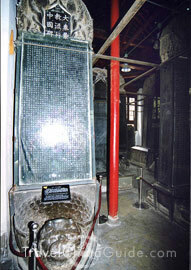 According to legend Baolian Deng (The Lotus Lantern), it was used by Chen Xiang to save his mother. 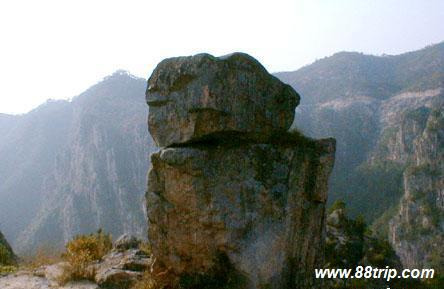 It is on the central peak of Huashan and stands on a natural stone tortoise. 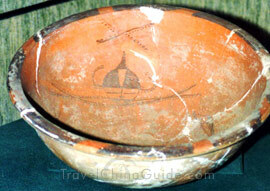 The Jade maiden was said to be Nong Yu -- daughter of Duke Mu of the Qin Dynasty (221-206BC). 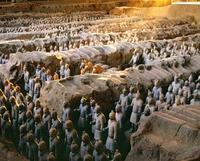 The story took place in the Spring and Autumn Period (770-476BC): A young man named Xiao Shi was good at playing bamboo flute. Nong Yu, who fell deeply in love with the poor young man, gave up all her nabobism to marry Xiao. The lovers came to Huashan and lived here for the rest of their life. To commemorate the couple, people built the Jade Maiden Shrine. The Northern Peak, also called the Cloud Terrace Summit, is the first one you will have to confront on an assault on the mountain. Although the smallest of the peaks here, it still provides a great challenge to climbers due to its devilish precipitousness. There is only one path on the ridge that winds to the south, a place that is notoriously easy to defend. 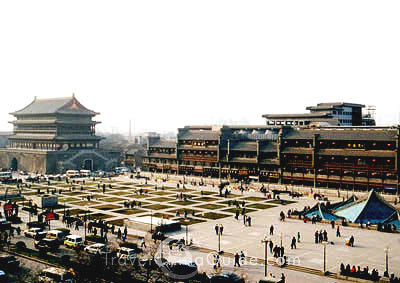 The route starts from near the Jade Fountain Temple (Yuchuan si) and follows a winding path called locally the "18 bends". After a slightly strenuous 3-4 hour climb you will arrive at the first peak, which is also home to the Zhenwu Taoist Temple (Zhenwu gong), a religious complex with a unique layout. The Eastern Peak is also known as the Sunrise Peak due to its acclaim as the best place for watching the rising or setting sun, as it dips below or rises from the usual sea of cloud. 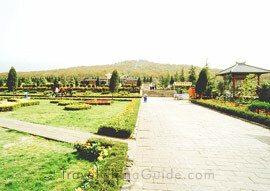 The attractions here, like those on the Southern Peak, are mostly Taoist influenced. 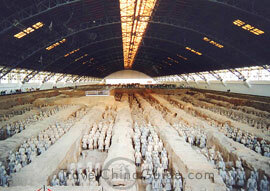 Of the best include a statue of the one-time mentor of Laozi, called Chengtuan, in the Sanmao Cave (Sanmao Dong) and the Losing Chess Pavilion (Shuqi Ting) that houses an iron chessboard. 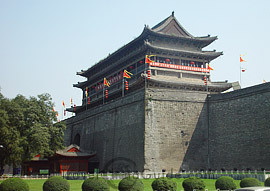 Legend has it that Chengtuan once had a game with the first emperor of the Northern Song Dynasty (960-1127 AD), winning the whole of Huashan from the emperor's stake.